The island of Vis is a small and the outermost Croatian island with an area of 90.30 km2, 77 kilometers long rocky shore and population of about 3 600 inhabitants. It is located on the open sea, 45 kilometers from the mainland and it is surrounded by archipelago which consists of many smaller islands and islets: Ravnik, Budikovac, Bisevo, Svetac, Jabuka, Brusnik and Palagruza. It is approximately 60 miles away from the Italian coast. The highest peak on the island is Hum with 587 meters over sea level. 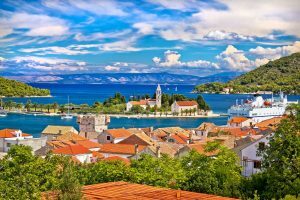 The island of Vis is a pearl among Croatian Adriatic islands, left untouched by the development of tourism for so many years – due to its strategic location on the open sea, it served as a military zone for many years. The island began opening slowly to the outside world, offering it’s unique traditions, history, cultural heritage and natural beauties and it is slowly becoming one of the most popular tourist destinations in Croatia. In a deep bay on the northern side of the island, in 397 BC, Dionysus the elder, general and tyrant of Syracuse, then the strongest state in the Greek world, founded the first Greek colony on the eastern coast of the Adriatic. But the history of the island goes back far into the past. Greek historian The Opompus (died in 323 BC) writes that the Ionian Sea (i.e. the Adriatic) got its name from Ionios, “an Illyrian from Issa who once ruled over these realms”; his figure is shown on the first coin of the colony of Issa, with a dolphin, symbol of the sea, on the reverse. In the relatively narrow Dracevo polje, or plain, on Vis, a regular orthogonal division of the land has been noticed – characteristic of the Greek division of land – and the same thing must have existed in Velo polje, until an aerodrome was built there in World War II. Before it switched from Greek to Roman rule, Issa had already established its own colonies on the mainland: Tragurion (Trogir), Epetion (Stobrec near Split) and on the neighboring island of Korcula, in Lumbarda, Korkira Melaina. During the civil war fought between Pompey and Caesar, the Issa polis chose the losing side of Pompey, and in 46 BC it lost its independence, becoming oppidium civium Romanorum, and was administratively dependent on Salona. At the time of Roman rule Issa did develop however, and a theater, temple, a forum and thermae were built there. When Salona became the Roman capital of the province, Issa was left on the periphery of events, and was known only for the high quality of its wine. At the beginning of the 2nd century BC, Greek historian and geographer Agatharchides (author of a geography and history of Europe in 10 volumes) wrote that there was no better wine in the world than that of Issa. Vis has always been an island of fishermen and winegrowers. 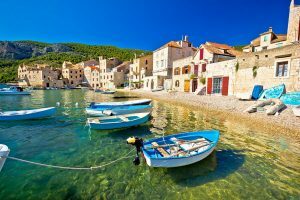 Komiza on the island of Vis is considered the cradle of fishing in the Adriatic, and in times gone by, the Komiza fishermen where well known in all Mediterranean harbours as experts in their field. Today the Fishing Museum in Komiza shows the famous history of the Vis fishermen. The most famous authentic white wine is definitely the famed Vis Vugava, which you can try in numerous restaurants and cellars on the island. Vugava is a high quality and potent wine, golden yellow in color with a slightly bitter aroma that recalls honey. Today, Vis including Bisevo has about 700 ha of vineyards. Some biographers of James Joyce quote the writer as being fondest of drinking Plavac from Vis. Today, Vis including Bisevo has about 700 ha of vineyards. Some biographers of James Joyce quote the writer as being fondest of drinking Plavac from Vis. The climate on the island of Vis is Mediterranean, and since it is located on the open sea, the minimum temperature on the island is always few degrees higher than on the mainland or other islands. Thanks to its climate the island of Vis is one of the best locations in Croatia for growing lemons and other citruses.